hallpad is a member of the pad group family. Founded in 1999, pad group is the UK’s leading provider of housing management software to the public sector. With extensive experience delivering cloud based software, pad group is recognised as the number one source of modern, exciting, cutting-edge housing software. Currently working with more than 100 organisations throughout the UK & Ireland, we have established a reputation for delivering a high-quality, prestigious service. As an authority in the marketplace, we are always striving to break new ground and are trusted by our customers to provide the very latest in housing management software. Since the launch of pad group’s first software platform in 1999, the customer has sat at the heart of all we do. pad group was launched with the simple objective of creating cloud based software to make lives easier for those managing housing in the public sector. The software that followed has gone on to revolutionise the way in which councils, housing associations, universities and students’ unions operate. And to this day our objective remains the same. The benefits however, are even wider reaching, as our software continues to develop. pad group is a key service delivery partner to some of the largest and most prestigious public sector organisations in the UK. With more than 100 organisations using our suite of software each day, we play a vital role in the delivery of accommodation services nationwide. Each of these customers benefit from a fully customised service built around their unique requirements. Our relentless focus on customer service explains our continued growth since launching in 1999 and the increasing interest in the varied applications of our software. Organisations choose pad group not just for the latest in housing software, but also for the highest levels of customer service that accompany it. Founder and Managing Director, Lloyd Cowburn (second from left), has overseen the launch, development and continued growth of the company since 1999. 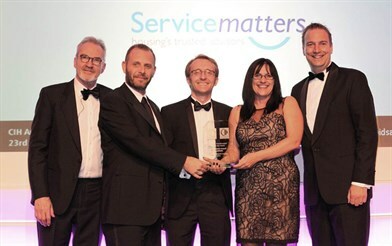 In this time, our talented and dedicated team have worked with each of our customers to ensure their success – work recognised with both superb levels of customer satisfaction and national awards.